Ernest Pettinato Obituary - Scranton, Pennsylvania | Solfanelli-Fiorillo Funeral Home Inc.
Ernest J. Pettinato of the Tripp Park section of Scranton passed away Thursday January 10, 2019 at Hospice of the Sacred Heart Inpatient Unit, Dunmore with his loving family by his side. 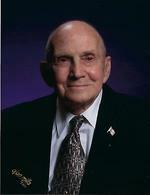 He and his wife, the former Dorothy M. Koskosky, would have celebrated 70 years of marriage on September 17th. Born in Scranton, he was the son of the late James P. and Mildred Evans Pettinato. He was a proud United States Army veteran of World War II and the Korean War, and a member of the American Legion Post #0121. Prior to his retirement he was employed as an electrician with the IBEW Local Union #81, and he was also a member of the International Brotherhood of Teamsters Local Union #229. He was a member of St. Stanislaus Polish National Catholic Church. He was also the dedicated Vice President of Our Savior Chapel, Elizabeth Street, Scranton, performing any task the church needed. He was an avid bowler, participating in various leagues over the years. He also enjoyed fishing, but most of all he was a hardworking family man that loved spending time with his children and grandchildren. Also surviving are his children, Patricia and husband Daniel Rist, Easthampton, Ma., Donny Pettinato and his companion Kelli, Scranton, Mary Ann and her husband Judge Andy Jarbola, Moscow; grandchildren, Megan Downey, David, Amy, Beth, and Matthew Rist, Alexis, and Tajana Pettinato, A.J. Jarbola IV, and Justin Jarbola; eleven great grandchildren and several nieces and nephews. He was preceded in death by a brother, James Pettinato. The funeral will be conducted Tuesday from the Solfanelli-Fiorillo Funeral Home Inc., 1030 N. Main Ave. with Mass at 10:00 a.m. in St. Stanislaus Polish National Catholic Church, 529 E. Locust St. Everyone wishing to attend the Mass is respectfully invited to go directly to the church. Family and friends may pay their respects Monday 4:00 to 7:00 p.m. at the funeral home. Interment at the parish cemetery will be held privately for the family. Memorial contributions may be made to Hospice of the Sacred Heart, 100 William Street, Dunmore, PA 18512.